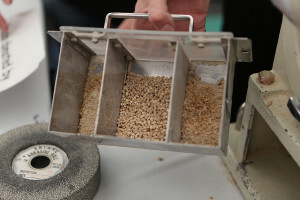 There are various barley products on the market—the most popular being pot and pearl barley. If you’re unsure how to differentiate between the two, you are not alone. To understand the difference between them, you must also take into consideration a third kind of barley—whole grain or “hulled” barley. Whole grain or “hulled” barley is the whole grain form of barley because only the outer husk or hull has been removed. Pot and pearl barley have been put through a pearling machine. This process, called pearling, removes the inedible hull and polishes the kernel. Pot barley has been pearled for a shorter amount of time and still has most of the barley bran intact. Pearl barley gets its name from the extra rounds of polishing it goes through. The pearling removes the hull, as well as the bran layer. Regardless of which type you choose, barley is always a healthy option. Whole grain or “hulled”, pot and pearl barley all fall under the Health Canada approved claim that links the consumption of three grams of barley beta-glucan per day to reduced cholesterol levels, keeping you heart healthy. Barley is versatile and can be used interchangeably in recipes. A great example of how pearl and pot barley can be interchangeably used is our Barley Casserole. We’ve taken a classic dish, the casserole, and reinvented it using either pearl or pot barley. This recipe is also a timesaver; preparation is minimal, then it goes into the oven for an hour, making it a convenient choice for busy weeknights. The centre bin contains the barley that has spent a few seconds in the pearler. The outside bins house the inedible hull and other material. 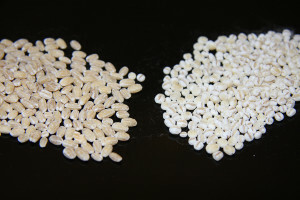 The difference between pot barley (left) and pearl barley (right) is subtle. Except for deserts, like pudding, don’t worry about substituting one for the other. Thank you. I often wondered about the difference between the two barleys, now I know.